Plant morphology is the field in botany that studies the diversity in forms, with the naked eye or slight optical magnification. This is opposed to plant anatomy (see Category:Plant anatomy) that needs to cut into plants to be able to study its subject, usually with a microscope. Wikimedia Commons has media related to Plant morphology. Pages in category "Plant morphology"
The following 200 pages are in this category, out of approximately 267 total. This list may not reflect recent changes (learn more). In botany, a bud is an undeveloped or embryonic shoot and normally occurs in the axil of a leaf or at the tip of a stem. Once formed, a bud may remain for some time in a dormant condition, buds may be specialized to develop flowers or short shoots, or may have the potential for general shoot development. The term bud is used in zoology, where it refers to an outgrowth from the body which can develop into a new individual. The buds of many plants, especially in temperate or cold climates, are protected by a covering of modified leaves called scales which tightly enclose the more delicate parts of the bud. Many bud scales are covered by a substance which serves as added protection. When the bud develops, the scales may enlarge somewhat but usually just drop off, leaving on the surface of the growing stem a series of horizontally-elongated scars. By means of these one can determine the age of any young branch, since each years growth ends in the formation of a bud. Continued growth of the branch causes these scars to be obliterated after a few years so that the age of older branches cannot be determined by this means. In many plants scales do not form over the bud, the minute underdeveloped leaves in such buds are often excessively hairy. Naked buds are found in shrubs, like some species of the Sumac and Viburnums. In many of the latter, buds are more reduced. A terminal bud occurs on the end of a stem and lateral buds are found on the side, a head of cabbage is an exceptionally large terminal bud, while Brussels sprouts are large lateral buds. Since buds are formed in the axils of leaves, their distribution on the stem is the same as that of leaves, there are alternate and whorled buds, as well as the terminal bud at the tip of the stem. In many plants buds appear in unexpected places, these are known as adventitious buds, often it is possible to find a bud in a remarkable series of gradations of bud scales. Such a series suggests that the scales of the bud are in truth leaves, buds are often useful in the identification of plants, especially for woody plants in winter when leaves have fallen. Buds may be classified and described according to different criteria, status, buds The term bud is used by analogy within zoology as well, where it refers to an outgrowth from the body which develops into a new individual. The axillary bud is an embryonic shoot located in the axil of a leaf. Each bud has the potential to form shoots, and may be specialized in producing either vegetative shoots or reproductive shoots, once formed, a bud may remain dormant for some time, or it may form a shoot immediately. An axillary bud is a shoot which lies dormant at the junction of the stem. It arises exogenously from outer layer of cortex of the stem, axillary bud do not become actively growing shoots on plants with strong apical dominance. Apical dominance occurs because the shoot apical meristem produces auxin which prevents axillary buds from growing, axillary buds can be used to differentiate if the plant is single-leafed or multi-leafed. Simply count the number of leaves after an axillary bud, if there is only one leaf, the plant is considered single-leafed, if not it is considered multi-leafed. An example of axillary buds are the eyes of the potato, as the apical meristem grows and forms leaves, it leaves behind a region of meristematic cells at the node between the stem and the leaf. A cone is an organ on plants in the division Pinophyta that contains the reproductive structures The familiar woody cone is the female cone, which produces seeds. The male cones, which produce pollen, are usually herbaceous, the name cone derives from the fact that the shape in some species resembles a geometric cone. The individual plates of a cone are known as scales, the male cone is structurally similar across all conifers, differing only in small ways from species to species. Extending out from an axis are microsporophylls. Under each microsporophyll is one or several microsporangia, the female cone contains ovules which, when fertilized by pollen, become seeds. The female cone structure varies more markedly between the different conifer families, and is crucial for the identification of many species of conifers. The members of the family have cones that are imbricate. The scales are arranged in fibonacci number ratios. The female cone has two types of scale, the scales, derived from a modified leaf, and the seed scales, one subtended by each bract scale. On the upper-side base of each seed scale are two ovules that develop into seeds after fertilization by pollen grains. The bract scales develop first, and are conspicuous at the time of pollination, the scales open temporarily to receive gametophytes, close during fertilization and maturation, and re-open again at maturity to allow the seed to escape. Maturation takes 6–8 months from pollination in most Pinaceae genera, but 12 months in cedars, the cones open either by the seed scales flexing back when they dry out, or by the cones disintegrating with the seed scales falling off. The cones are conic, cylindrical or ovoid, and small to large, from 2–60 cm long. After ripening, the opening of non-serotinous pine cones is associated with their moisture content—cones are open when dry and this assures that the small, wind disseminated seeds will be dispersed during relatively dry weather, and thus, the distance traveled from the parent tree will be enhanced. A pine cone will go through cycles of opening and closing during its life span. Anemophily or wind pollination is a form of pollination whereby pollen is distributed by wind. Almost all gymnosperms are anemophilous, as are plants in the order Poales. Other common anemophilous plants are oaks, sweet chestnuts and members of the family Juglandaceae, features of the wind-pollination syndrome include a lack of scent production, a lack of showy floral parts, reduced production of nectar, and the production of enormous numbers of pollen grains. This distinguishes them from entomophilous and zoophilous species, anemophilous pollen grains are light and non-sticky, so that they can be transported by air currents. They are typically 20–60 micrometres in diameter, although the pollen grains of Pinus species can be much larger, anemophilous plants possess well-exposed stamens so that the pollens are exposed to wind currents and have large and feathery stigma to easily trap airborne pollen grains. Pollen from anemophilous plants tends to be smaller and lighter than pollen from entomophilous ones, insects sometimes gather pollen from staminate anemophilous flowers at times when higher-protein pollens from entomophilous flowers are scarce. Biosequestration is the capture and storage of the atmospheric greenhouse gas carbon dioxide by biological processes. 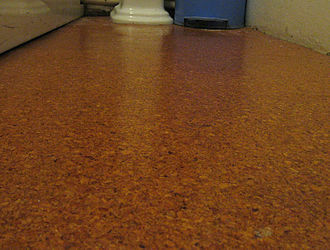 Biosequestration as a process has occurred in the past, and was responsible for the formation of the extensive coal. It is a key concept in the climate change mitigation debate. After water vapour carbon dioxide is the most abundant and stable greenhouse gas in the atmosphere, atmospheric carbon dioxide has increased from about 280 ppm in 1750 to 383 ppm in 2007 and is increasing at an average rate of 2 ppm pr year. The worlds oceans have previously played an important role in sequestering atmospheric carbon dioxide through solubility and this, and the likely adverse consequences for humans and the biosphere of associated global warming, increases the significance of investigating policy mechanisms for encouraging biosequestration. The Intergovernmental Panel on Climate Change estimates that the cutting down of forests is now contributing close to 20 per cent of the greenhouse gases entering the atmosphere. Candell and Raupach argue that there are four ways in which reforestation. First, by increasing the volume of existing forest, second, by increasing the carbon density of existing forests at a stand and landscape scale. Third, by expanding the use of forest products that will sustainably replace fossil-fuel emissions, fourth, by reducing carbon emissions that are caused from deforestation and degradation. Land clearing reductions, the majority of the time, create biodiversity benefits in a vast expanse of land regions, since 1990, emissions from the energy sector have increased 35 per cent. By comparison, emissions from LULUCF have fallen by 73%, satellite imaging has become crucial in obtaining data on levels of deforestation and reforestation. The project yielded deforestation maps for the Amazon Basin, Central Africa, biosequestration may be enhanced by improving photosynthetic efficiency by modifying RuBisCO genes in plants to increase the catalytic and/or oxygenation activity of that enzyme. One such research area involves increasing the Earths proportion of C4 carbon fixation photosynthetic plants, C4 plants represent about 5% of Earths plant biomass and 1% of its known plant species, but account for around 30% of terrestrial carbon fixation. In leaves of C3 plants, captured photons of solar energy undergo photosynthesis which assimilates carbon into carbohydrates in the chloroplasts of the mesophyll cells, the C4 photosynthetic pathway, concentrates CO2 at the site of the reaction of Rubisco, thereby reducing the biosequestration-inhibiting photorespiration. A new frontier in crop science consists of attempts to genetically engineer C3 staple food crops with the photosynthetic apparatus of C4 plants. Biochar is a potent form of longterm biosequestration of atmosphereic CO2 derived from investigation of the extremely fertile Terra preta soils of the Amazon Basin, placing biochar in soils improves water quality, increases soil fertility, raises agricultural productivity and reduce pressure on old growth forests. A bur is a seed or dry fruit or infructescence that has hooks or teeth. Some other forms of diaspores, such as the stems of species of cactus are covered with thorns. Bur-bearing plants such as Xanthium species are often single-stemmed when growing in dense groups, burs catch on the fur of passing animals or the clothing of people. The hooks or teeth generally cause irritation, and some species commonly cause gross injury to animals, burs serve the plants that bear them in two main ways. Firstly, burs tend to some herbivores, much as other spines and prickles do. Secondly, plants with burs rely largely on living agents to disperse their seeds, most epizoochorous burs attach to hair on the body or legs of the host animal, but a special class of epizoochorous bur is known as the trample-bur. Several species of Tribulus and Grielum produce fruit in the form of trample-burs, as the name suggests, they attach themselves to the animal when trampled. Burs are best known as sources of irritation, injury to livestock, damage to clothing, punctures to tires, some have however been used for such purposes as fabric fulling, for which the fullers teasel is a traditional resource. 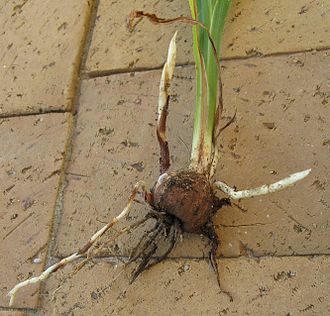 Botanists distinguish between true bulbs, rhizomes and tuberous roots, any of which may be termed bulbs in horticulture. Bulb species usually lose their upper parts during adverse conditions such as summer drought, the bulbs storage organs contain moisture and nutrients that are used to survive these adverse conditions in a dormant state. When conditions become favourable the reserves sustain a new growth cycle, in addition, bulbs permit vegetative or asexual multiplication in these species. Ornamental bulbs are used in parks and gardens and as cut flowers, the word bulb has a somewhat different meaning to botanists than it does to gardeners and horticulturalists. In the context of gardening, a bulb is an underground or ground-level storage organ that can be dried and sold in this state. Many bulbs in this sense are produced by geophytes, i. e. plants whose growing point is below ground level, not all bulbs in the gardening sense are produced by geophytes. For example, rhizomatous irises are included in books on ornamental bulbs, many bulbs are produced by lilioid monocots, but not all lilioid monocots have bulbs. Brian Mathew says that we just have to accept there is no accurate term which we can use for this group of plants. Botanically, gardeners bulbs may be true bulbs, rhizomes or tubers, a true bulb is an underground vertical shoot that has modified leaves that are used as food storage organs by the plant. 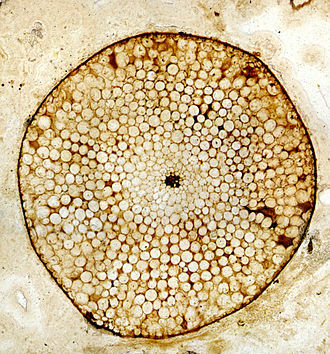 The bottom of the bulb is made up of a section of stem forming the basal plate. 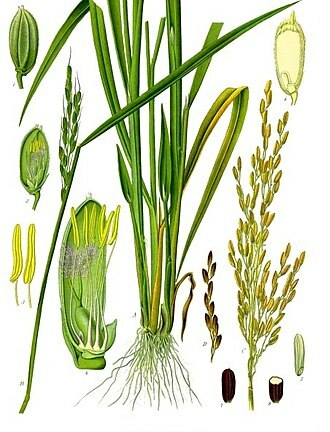 Storage leaves are produced from the top of the basal plate, other examples of species with true bulbs, apart from those already mentioned, are Muscari and Narcissus. A corm is a short, swollen underground plant stem consisting of one or more internodes with at least one growing point, the thin tunic leaves are dry papery, dead sheaths, formed from the leaves produced the year before. 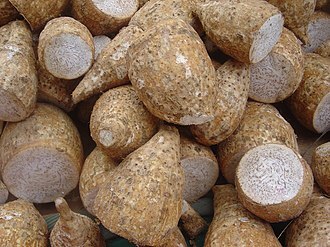 They act as a covering that protects the corm from insects, internally a corm is mostly made of starch-containing parenchyma cells above a more-or-less circular basal node that grows roots. A rhizome is a stem that often grows underground, usually sending out roots and shoots from its nodes. This page provides a glossary of plant morphology. These terms are used to identify and classify plants and this page is provided to help in understanding the numerous other pages describing plants by their various taxa. The accompanying page Plant morphology provides an overview of the science of studying the form of plants. There is an alphabetical list, a Glossary of botanical terms, while this page deals with botanical terms in a systematic manner, the internal structure is dealt with in Plant anatomy, and function in Plant physiology. Primarily, these are terms that deal with the vascular plants, in contrast the non-vascular plants, with their different evolutionary background, tend to have their own particular terminology. Although plant morphology is integrated with plant anatomy, the former which requires few tools was the basis of the description of plants that exists today. Since the terms used have been handed down from the earliest herbalists and botanists, as far back as Theophrastus and these terms have been modified and added to over the years and different authorities may not always use them in exactly the same way. This page has two parts, The first deals with general plant terms, and the second with specific plant structures or parts, abaxial – located on the side facing away from the axis. Adaxial – located on the side facing towards the axis, Plant habit refers to the overall shape of a plant. It has a number of such as stem length and development, branching pattern. While many plants fit easily into some main categories, such as grasses, shrubs or trees, the habit of a plant provides important information about its ecology, that is how it has adapted to its environment. Each habit indicates a different adaptive ecological strategy, habit is associated with the development of the plant and may change as the plant grows, more properly called its growth habit. In addition to shape, habit indicates its structure, for instance whether herbaceous or woody, while woody plants tend to be tall and relatively long lived, herbaceous plants are shorter and seasonal, dying back at the end of their growth season. Asclepias syriaca showing complex morphology of the flowers. Variation in leaves from the giant ragweed illustrating positional effects. The lobed leaves come from the base of the plant, while the unlobed leaves come from the top of the plant. Eriocephalus africanus, showing lightly arachnoid leaves, and heavily arachnoid seed follicles. NASA Earth Observatory, 2009. Deforestation in Malaysian Borneo. Crocosmia corm anatomy, showing tunic, cortex of storage tissue, central medulla, and emergence of a new corm from a bud near the top. Cotyledon from a Judas-tree (Cercis siliquastrum) seedling. Peanut seeds split in half showing the embryos with cotyledons and primordial root. Two week old Douglas fir with seven cotyledons. 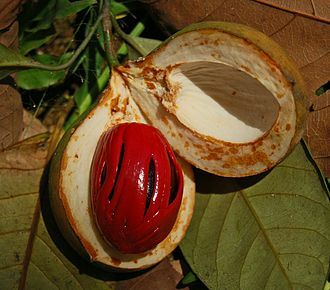 An aril that surrounds the nutmeg seed is used as a spice called mace. The edible white aril of Litchi chinensis is sometimes called an arillode or false aril. It grows partly from the funiculus and partly from the integument of the seed. 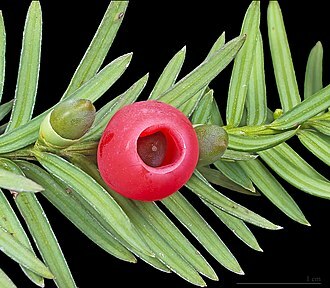 The fleshy aril that surrounds each seed in the yew is a highly modified seed cone scale. Example of an axillary bud. Axillary buds have the potential to form new shoots and become branches or flowers. Axillary buds only develop if they're not exposed to high levels of auxin from the terminal bud. Axillary buds are located at the intersection of the leaf and stem of a plant. Anemophilous plants, such as this pine (Pinus) produce large quantities of pollen, which is carried on the wind. The flowers of wind-pollinated flowering plants, such as this saw-tooth oak (Quercus acutissima), are less showy than insect-pollinated flowers. Calyptra on top of the brown spore capsule (sporophyte) of the moss Physcomitrella patens. The brownish archegonial venter is still visible. Leaf bud of American Sweet gum (Liquidambar styraciflua); the cataphylls covering the bud show a little chlorophyll, but they will be shed instead of growing into photosynthetic leaves. The stems of Athrotaxis are covered with small flat pointed leaves called "scale leaves" or "cataphylls". The caudex of a tree fern resembles the trunk of a woody plant, but has a different structure. The caudex of Jatropha cathartica is pachycaul, with thickening that provides water storage.